I explained the concept of velocity in sprints. Though the warm up has a slow start and is less technical it builds in intensity making the final stages faster and highly technical. Therefore, at the end of the warm up, athletes should be ready to roll. If not, the warm up did not achieve its goal. During this workout (block 10-20’s) I allow athletes to go on their own so that I can provide individual attention and critique for each sprinter. Though these accelerations are not timed, I closely monitor the effort and velocity of my athletes as the workout progresses. Whenever I find my sprinters are struggling to reach their max effort, I let them go in groups of 2-4 reacting to a clap. Naturally, when sprinters are positioned in a lane next to another sprinter, their effort improves and their velocity increases. This is important because the human body will not adapt to stimulus it does not encounter in practice at meets. 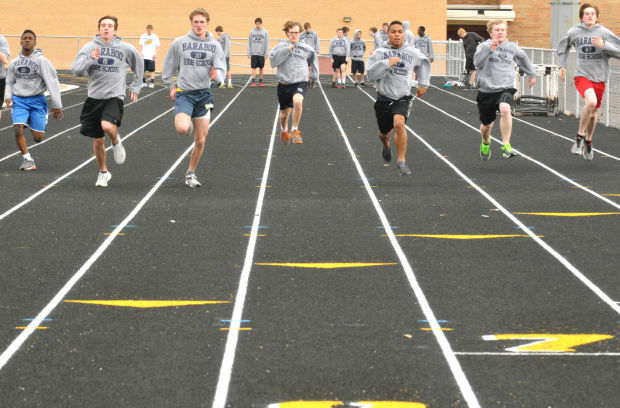 I tell my athletes that if they don’t train their bodies to run fast at practice, they will never attain the results they are looking for at meets. If your athletes performance seems to wane during neurological workouts and you wonder what you can do to fix it, line them up next to one another. No athlete wants to lose to his or her friends and competition always boosts effort. My only warning is that sometimes competition can cause athletes to focus on winning and not execution. For example, one of my athletes was pumped during this workout because he kept beating his teammates to the 10m mark. He was completely puzzled when I explained that he was accelerating incorrectly. The athlete was so focused on getting to the 10m mark first that he sold out. Instead of being powerful and covering ground, he was rushing through his ‘drive phase’. For an athlete, this concept might be tough to grasp. If they are beating everyone to the mark, they must be doing something right. For the next set, I lined up the same group of sprinters and extended the distance to 40m. This athlete once again won the battle to 10m then started to get swallowed up around the 25m mark and was one of the last athletes to the 40m mark. I then went on to explain to the group that the 100m is a progressive number of battles that lead up to winning the war. In the 100m, winning the war occurs at the 100m mark. Before we started the next set to 10m, I asked the athletes to get to the 10m mark correctly. I emphasized the importance of going through a full range of motion as fast as humanly possible while being explosive and maintaining correct form. I also added that their effort and execution would be combined for an overall score. I graded them using the letter system. Student athletes definitely understand the different between an A and an F. Thankfully, my athletes passed and I did not have to give out an F.
For more coaching advice from Coach Mangiacotti, read: Why Do Kids Point Fingers? Adding competition increased the effort. Scoring the athletes increased their focus. Really good things can happen if a coach can find a way to increase both of these at practices. The human body will not adapt to mental and physical stimulus unless it is practiced. Yes…Allen Iverson…we are talking about practice.